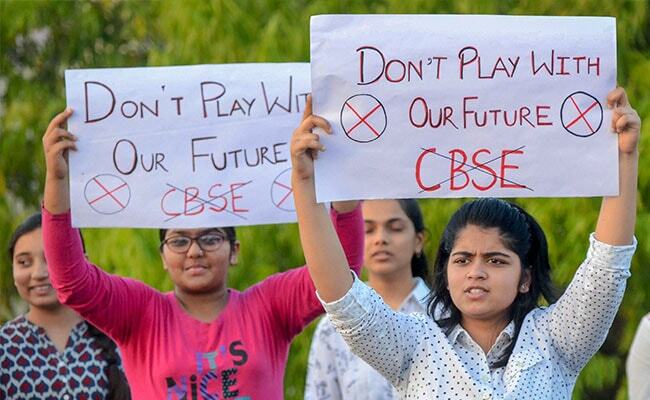 CBSE students continued to hold protests across the country after the HRD Ministry announced rescheduled dates for the Economics examination yesterday. New Delhi: Scuttled holiday plans, clashes with entrance dates, another round of tuitions and above all the 'phobia' of facing the examination day yet again -- sum up the dilemma faced by class 10 and 12 students of CBSE across the country. "We are really disappointed. The CBSE chairman was aware of the leak of Mathematics paper a day before the examination. They should have cancelled the paper earlier itself. Many of us had plans to go for a vacation, but the plans stand cancelled now". "First of all, the authorities should have ensured there was no paper leak. Why should we suffer and go through the same drill? The paper was so good and now we have to again prepare for it. Also, my film making entrance exams are clashing with the tentative dates being announced by CBSE on television". "The state Joint Entrance Board Engineering examinations will be held on April 22. Will the CBSE authorities explain how can one prepare for the Economics re-examination on April 25 while preparing for the engineering entrance which is far more tough?" "I am feeling pressured and it is very difficult for me to study Maths again. Recalling all those formulae is tough. I have to again take tuitions and pay the fees. I feel that the coming paper (re-test) will be tougher. Also, my entrance exam for another school has also been affected". "I used to spend 16 hours everyday to prepare for the board exams. And then you come to know that the papers have been leaked. What is the guarantee that the re-examination will not be tampered with? If our system is flawed, what is the fault of students?" "All my plans have gone haywire with these developments. My preparations for admission to the Presidency University, Kolkata and Benaras Hindu University, where the entrance exams will be held in mid-April and May, respectively will now be affected". "I got to know that question papers were being offered at Rs 16,000 a night before the exam, and Rs 3,000 if one wanted it on the examination day. This is such a sorry state of affairs. I had planned to go out of station after the exams, but now I have to again face the exam". "If such an incident happens, there should be a re-exam, but the energy levels of students will not be same as before. Punishing all students for a few people's mistake is unfair". "My entrance tests are lined up from April 20. I had also enrolled myself for various crash courses. Now, what should I do? Should I prepare for the re-examination or the entrance? I am confused". "There is confusion about the Maths re-test. It is adding to our stress level. The CBSE should clear the confusion".